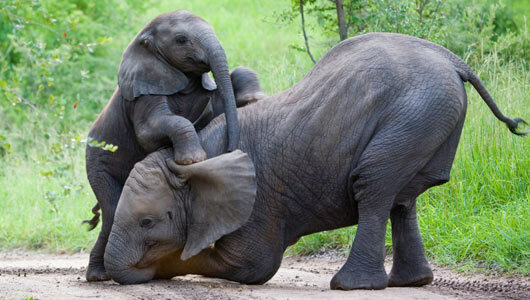 Empathetic behaviour has been anecdotally reported in elephants. In India an elephant was following a truck and, upon command, was pulling logs out of it to place in pre-dug holes in preparation for a ceremony. The elephant continued to follow his master’s commands until they reached one hole where the elephant would not lower the log into the hole but held it in mid-air above the hole. When the elephant’s handler approached the hole to investigate, he found a dog sleeping at the bottom; only after chasing the dog away would the elephant lower the post into the hole. This wonderful footage shows adult elephants working together to help rescue a baby elephant stuck in mud. Clearly they are showing empathy for the vulnerable youngster. Shoshani, J 1992 Elephants. Ed. Emmaus, Pennsylvania: Rodale Press.